You are here: Home / SoCal City Kids News / Voodoo Doughnut Now Open at Universal CityWalk Just in Time for National Doughnut Day! Founders Tres Shannon & Kenneth (Cat Daddy) Pogson at Voodoo Doughnut at Universal CityWalk. Good things come in pink boxes is Voodoo Doughnut’s mantra as the irreverent, world famous pastry shop sweetens up Universal CityWalk with its first-ever California location, situated adjacent to Universal Studios Hollywood, The Entertainment Capital of L.A.
Voodoo Doughnut at Universal CityWalk is now open. “We are beyond thrilled to open Voodoo Doughnut at Universal CityWalk and share our menu of fabulous doughnuts with the world at the top entertainment destination in Los Angeles,” said Voodoo Doughnut founder, Kenneth “Cat Daddy” Pogson. Hailing originally from Portland, Oregon by founders Kenneth “Cat Daddy” Pogson and Tres Shannon, the new L.A. pastry shop serves a range of 60 eclectic doughnuts, including vegan options and the Hollywood Cream, created for Universal CityWalk. A variety of scrumptious flavored doughnuts are available, such as Grape Ape, Mango Tango, the Voodoo Bubble and Bacon Maple Bar as well as their iconic Voodoo Doll. 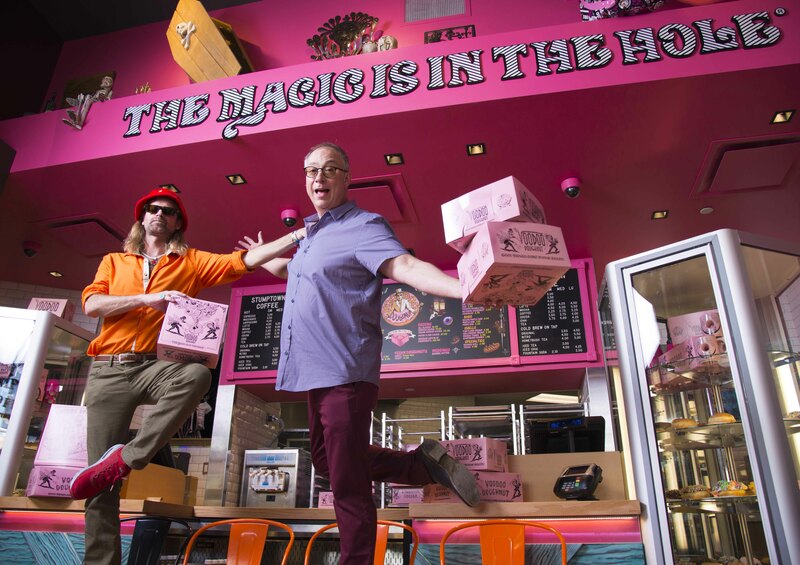 A popular take-out option, Voodoo Doughnuts are served in signature pink boxes or in a custom-made wooden coffin. The new location also features another Portland specialty: Stumptown coffee, which brews regularly from the first-ever pink Stumptown espresso machine located exclusively at Universal CityWalk’s Voodoo Doughnut. Keeping with their longstanding tradition, Voodoo Doughnut helps celebrate marital bliss by hosting weddings ceremonies, complete with a doughnut and coffee catered reception. The new Voodoo Doughnut shop finds its sweet spot at the inimitable Universal CityWalk, located near the “5 Towers” outdoor concert stage and adjacent to Universal Cinema, which recently completed a multi-million dollar renovation and features deluxe recliner seating. Voodoo Doughnut has expanded to multiple U.S. cities in Eugene, Ore., Denver, Colo., and Austin, Texas. The CityWalk location marks their first California establishment. Universal Studios Hollywood is The Entertainment Capital of L.A. and includes a full-day, movie-based theme park and Studio Tour. As a leading global entertainment destination, Universal Studios Hollywood delivers highly themed immersive lands that translate to real-life interpretations of iconic movie and television shows. Recent additions include “The Wizarding World of Harry Potter™” which features a bustling Hogsmeade village and such critically-acclaimed rides as “Harry Potter and the Forbidden Journey” and“Flight of the Hippogriff™,” Universal Studios Hollywood’s first outdoor roller coaster. Other immersive lands include “Despicable Me Minion Mayhem” and “Super Silly Fun Land” as well as “Springfield,” hometown of America’s favorite TV family, located adjacent to the award-winning “The Simpsons RideTM” and the “The Walking Dead” daytime attraction. The world-renowned Studio Tour is Universal Studios Hollywood’s signature attraction, inviting guests behind-the-scenes of the world’s biggest and busiest movie and television studio where they can also experience such authentic and immersive thrill rides as “Fast & Furious—Supercharged.” The adjacent Universal CityWalk entertainment, shopping and dining complex also includes the all-new multi-million dollar, completely redesigned Universal Cinema, featuring deluxe recliner seating in screening room quality theatres, and the “5 Towers” state-of-the-art outdoor concert stage. Photo Credit: Nathaniel Chadwick/Universal CityWalk.